If used on a laptop with a malfunctioning WiFi card, it could get in the way. Other Thoughts: So, I got this for my mom in a PC build I made for her after her old PC went kaput. In this case, it fit nicely into the back of the desktop, and could pick up a signal from everywhere in her two-storey house without too much issue. The aesthetics of the adapter and the rather overly-done packaging I received it in lead me to believe that perhaps I got this on sale lol. I mean, it may be a bit over-done for an N-band 150 Mb/s adapter. But, in the end, ma is happy, so it is all good with me. Other Thoughts: It's completely flawless, construction is solid, compact, works really well, was able to hit around 150mbps every speedtest, has been unable to let me down after heavy package capture use, works well in monitor mode and far superior to a built in laptop Wireless AC card. Worth every cent! Pros: This device was installed in a PC approximately 70 feet and 4 dry wall & wooden stud walls away and still gets almost as good of wireless connection as the PC that's connected via ethernet to the router. I liked it so much that I've bought 3 more for the other computers around the church that wireless connected also. Cons: No cons at all so far. 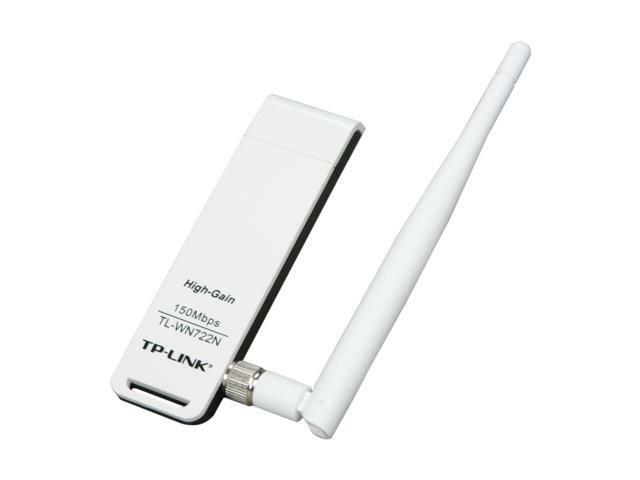 Other Thoughts: I would recommend this to anyone who needs a wireless connection for a desktop PC or perhaps a laptop with a defunct wireless device. It has great range. Pros: -Worked right out of the box on Win7. -Decent range, first place I used it was a rental house, through one interior wall about 15 feet from the router, used it in our current house before I ran CAT5e drops, about 30ft from the router through 4 interior walls. Cons: -A bit wider than a standard USB port, if you are short on ports it might block the adjacent port. Was not a problem for me. Other Thoughts: I used it on an older PC that is used primarily for email, MS Office and occasionally browsing YouTube and it seemed to be fast enough for me. I never measured the speeds, but I have no complaints for my use case. Pros: My WiFi router is downtstairs so i needed an alternative like this. It works decently but loses connection frequently might just be my WiFi. I would just take the extra time and or money to get hooked up via Ethernet. Pros: It works with mac and windows computers. Cons: Does not work with Synology or certain other Linux systems that require the Atheros V1 version of this product. If I had known this, I would not have bought it. Newegg should post the version of the adaptor so users know not to buy it. This is critical information and would have saved much frustration. Other Thoughts: I would not recommend this product. Since most laptops have wireless already, these adaptors are purchased mostly for adding wireless to synology or other devices. Since this adaptor is incompatible for these applications, what is the point of it?